2019 Updated Edition. Penguin and Panda, Panda and Penguin. Learn how to “work around” these algorithmic updates from Google. Learn SEO in Seven Steps. SEO, of course, is the art and science of getting your company to the top of Google and Bing. Learn SEO in Seven Steps: clearly explained in plain English! VIDEOS & QUIZZES– extensive ‘how to,’ ‘step by step’ videos that make SEO easy! A Systematic Approach to SEO. Purchase the SEO Workbook and gain access to the companion SEO Toolbook, filled with hundreds of free tools for Search Engine Optimization as well as worksheets, videos, and a step-by-step methodology that leads you to success! But there is only one workbook: the SEO Fitness Workbook. How is a workbook different from a book on SEO? Here’s how. First of all, this workbook speaks in practical, no-nonsense English. Whereas most of the SEO books out there are by experts for experts, this workbook explains SEO in plain English and does not get lost in the details. Most businesspeople don’t need to know every gory detail about SEO; rather they need practical, hands-on advice about what to do first, second, third and so forth. Secondly, the SEO Fitness Workbook is hands-on. Most SEO books are meant to be passively read. SEO Fitness Workbook, by contrast, gives you “hands on” worksheets and deliverables. In fact, each chapter ends with a deliverable marked in red. Each chapter also has TODOS (marked in RED) because a workbook is not just about reading, it’s about doing and succeeding. 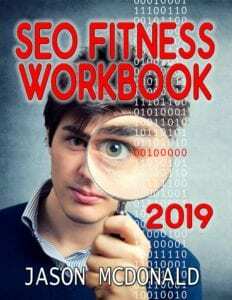 Third, while most books are outdated on the day they are published, the SEO Fitness Workbook connects to lively Internet resources such as free SEO tools and hands-on YouTube videos that show you how to succeed. After all, in the 21st century, a “how to” book should be more than a book, shouldn’t it? It should be a gateway to Internet knowledge. Last but not least, watch a few of my YouTube videos; you’ll find I am as crazy and enthusiastic on video as I am in this book!